This is a post by Free Homeschool Deals contributor, Lauren of Mama’s Learning Corner! 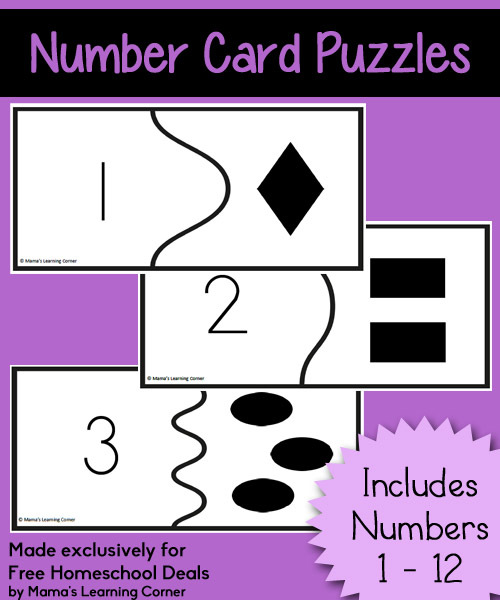 To use the Number Card Puzzles, simply download and print on cardstock. Laminate for longer durability. Then cut apart the puzzles on the heavy dark lines. Each puzzle contains 2 pieces: the number on one half and the shapes on the other. Once you’ve prepared the game, it’s time to match! For younger learners, give only a few puzzle pieces at the time so they aren’t frustrated. Older learners can piece together the whole set. –> Please note that this Number Card Puzzle Set is for your personal use with your own children or grandchildren only. Please stop by Mama’s Learning Corner for more free Puzzle Cards! You’ll find ABCs, rhyming words, and more! Color-By-Number Mini-Coloring Book: Heart Themed!